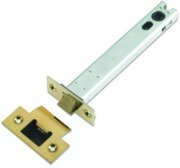 Extra long 6 inch (152mm) tubular mortice latch, with 132mm backset to centre spindle. Heavy duty sprung designed for use with unsprung door knobs for extra clearance away from door frame. Suitable for use with bolt through fixings. Heavy sprung tubular mortice latch, specified for use with unsprung heavy door handles. Available in 2 ½, 3 & 4 inch sizes, in brass or satin stainless steel. (NOT suitable for use with door knobs). NB: The 2 ½ inch latch will not take bolt through fixings. Budget economy tubular mortice latches. Available in 2 ½ inch (64mm) and 3 inch (76mm), in brassed, florentine bronze, black or chrome/nickel plate finishes. Standard bolt through tubular door latches for use with light weight sprung door levers with a bolt through fitting. Available in 2 ½ inch (64mm) and 3 inch (76mm), in brass, polished chrome or nickel plate finishes. Zoo horizontal mortice door latch for period properties. Available in 5inch (124mm x 70mm) & 6inch (149mm x 70mm) case sizes. 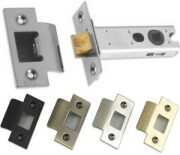 5inch latch has 4inch (101mm) backset to centre spindle, 6inch latch has 5inch (127mm) backset. With brass or chrome forend and strike plate. Union FastLatch, the best push fit latch all round. Quick and easy to install. 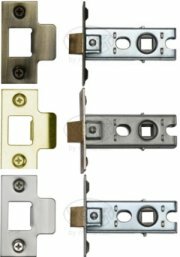 Choice of three finishes with matching latch, faceplate and strike plate. The FastLatch is supplied with both round and square corner strike plate options. 2 ½ inch (60mm) latch has 44mm backset from door to centre spindle. 3 inch (73mm) latch has 57mm backset from door to centre spindle. Magnetic tubular door latches with a concealed small powerful magnet. When the door is in the open position the latch bolt is hidden within the door creating a sleek minimalist look. When the door is closed the magnet withdraws the bolt from the latch case keeping the door held closed and shut. To open the door again any door handle can be used, when the lever is pulled downwards the latch is pulled away from the strike plate. Another magnet located in the back of the latch holds the latch bolt within the case until closed again. Overall length 77mm, available with either a 45mm or 57 mm backset to the centre of the door handle. Supplied with 25mm x 60mm square and radius forend in either stainless steel or brass. 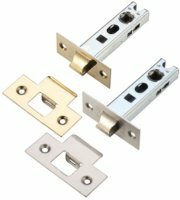 Rebate set (½ inch, 13mm) for standard tubular mortice latches, and heavy duty latches, for french double doors in brassed or silver nickel plate finishes. 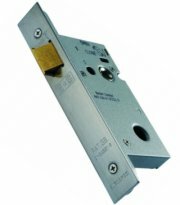 Upright door latch, suitable for use with sprung or unsprung door furniture. Available in 2 ½ inch (64mm) or 3 inch (76mm) sizes, with brass or satin stainless steel plate finish. From The Anvil solid cast brass suffolk latch set. Fully reversible, very simple yet very pleasing design with a smooth finish. Sold with all fixing and screws.